Soft pads and drone sounds mingle here with grooving bass. The drum and percussion elements have partially a bit more drive than on the previous album, and especially the melodies are more diverse and sophisticated. Mystic Crock combed through the archives of his music studio and came across many unpublished rough diamonds, which he remixed and awakened to new life (eg, "The Difference"). 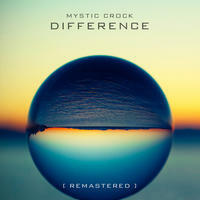 With "Difference", his second solo album, Mystic Crock continues the great work shown on his debut album "Nomad" and preserves its ambient and chillout style.